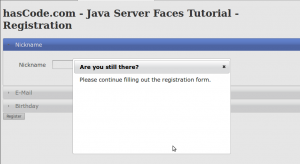 For this tutorial we’re going to reuse the web application from my JSF2 Tutorial “Java Server Faces/JSF 2 Tutorial – Step 1: Project setup, Maven and the first Facelet” – the source code is available at Bitbucket.org. 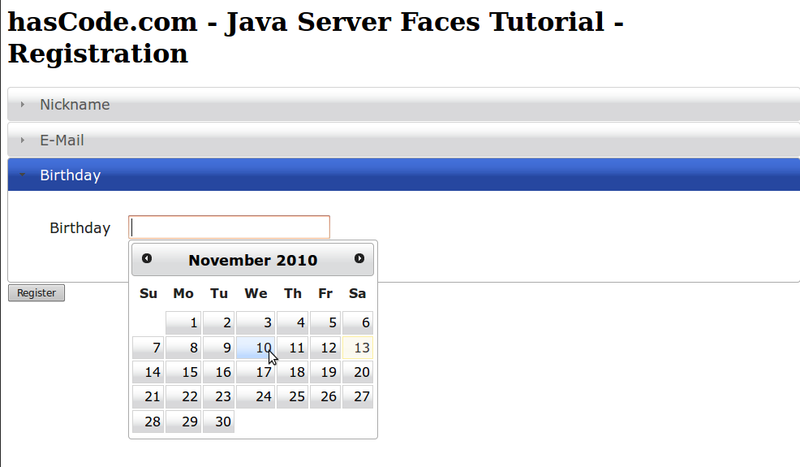 Now that we’ve got a running JSF2 web app lets start to add some shiny UI elements with PrimeFaces.. 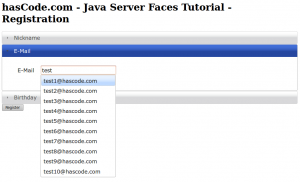 Integrating PrimeFaces into your existing Java Server Faces application is quite easy and it takes only two steps if you’re using PrimeFaces >= 2.2 (thanks Cagatay Civici for mentioning!) .. The only dependency PrimeFaces itself needs is Java 5+ and a Java Server Faces 1.2+ implementation but some special components require additional dependencies. 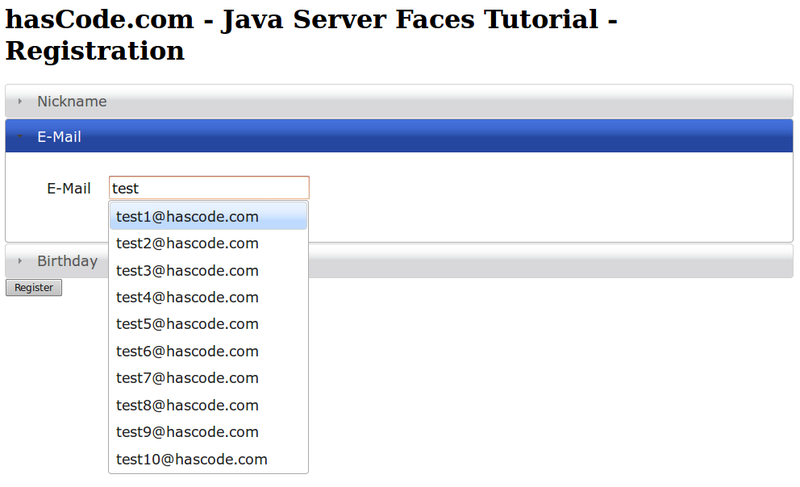 For more detailed information take a look at chapter “2.2 Dependencies” in the PrimeFaces Users Guide. FileUpload Component: commons-fileupload 1.2.1+ and commons-io 1.4+ for .. as you might have guessed .. file uploads ..
<p:dialog header="Are you still there?" resizable="false"
All PrimeFaces UI elements are ThemeRoller compatible .. just add the ThemeSwitcher component to the registration form to play around with the different default skins. For more information about ThemeRoller and the jQuery UI CSS Framework take a look at the documentation. We have added some nice and rich UI components in only a few steps and without major modifications in our managed beans or the runtime environment needed. To grab an interesting component from the Showcases Website and integrate them into an existing layout is made really easy and helpful documentation is also available. In a real-world productive scenario we surely were forced to adjust the UI components according to a given/existing design and to deliberate about whether a component might harm the accessibility of the application. Imho PrimeFaces is indeed a very nice addition to the JSF world and might save you some time and nerves when implementing special UI components. If you want to see the web application in action, take a look at this screencast on YouTube. 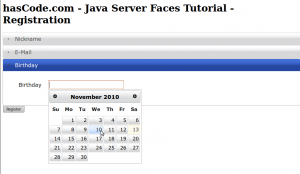 This entry was posted on Sunday, November 14th, 2010 at 2:59 pm	and is filed under Java. You can follow any responses to this entry through the RSS 2.0 feed. You can skip to the end and leave a response. Pinging is currently not allowed. 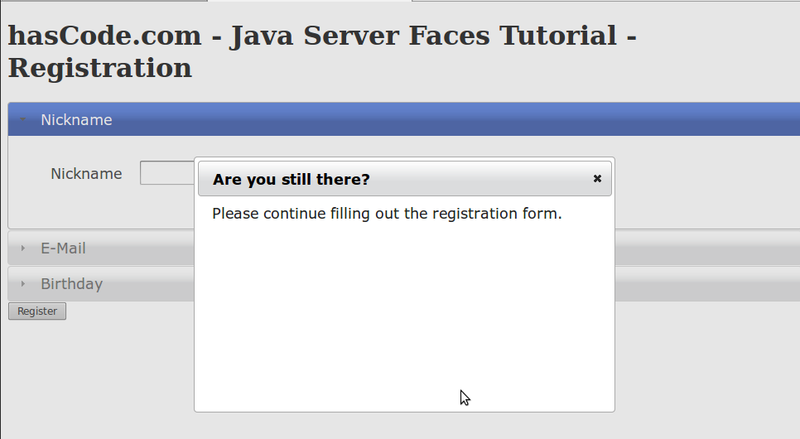 Just a quick note, point 3 is not needed as of PrimeFaces 2.2, there is no need for any type of configuration.